Hey guys! Today I am teaming up with my awesome group of #GuidedReadingGals that I have been working with over the summer to bring you an amazing book study! Now it is my turn to host Chapter 3! Have I mentioned lately how much I love this book! It has me so excited to go back and start reading groups! Now I know in Kindergarten we don't start Guided Reading on the first day of school. But when we do, this time I will be ready! Chapter 3 is all about those Pre-Readers and beginning readers. Perfect for Kindergarten! Now Chapter 3 is a huge chapter and covers so much! So we decided to break it down into two parts so we didn't overwhelm you. 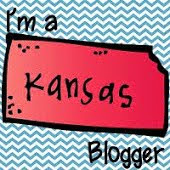 Head on over to Marie's blog To read Part 1, Pre-A Readers. Let's start with 3 things that I learned from this chapter. This is the hardest part for me because I have learned so many more things than just three but let's see if I can narrow it down to the three biggest things! Make sure the text does not have too many unfamiliar words or concepts because they may become frustrated while reading. But also make sure the text is not too easy because the children may memorize the pattern and not read the text. Using pointers may help students follow along with each word as they read instead of memorizing patterns in the text. 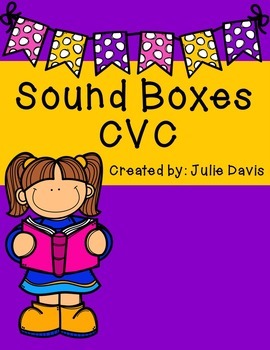 2.Sound Boxes - I have used these in the past but usually in centers. I do not think that I fully utilized their potential in a small group setting. This is definitely one aspect I will add to my Guided Reading routine. Jan Richardson states that this is the most difficult activity for these learners. Students must hear some consonants and at least one vowel to be successful. This will take time for students to be able to complete independently. There are many ways that you can use sound boxes. I wish I had more pictures for you so let me try to explain some ideas. 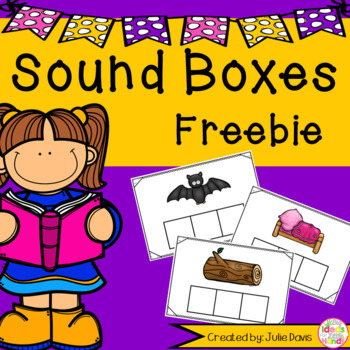 Sound boxes can be done as simple as placing a sound box template in a sheet protector and having students write the sounds they hear for a given word in each box. 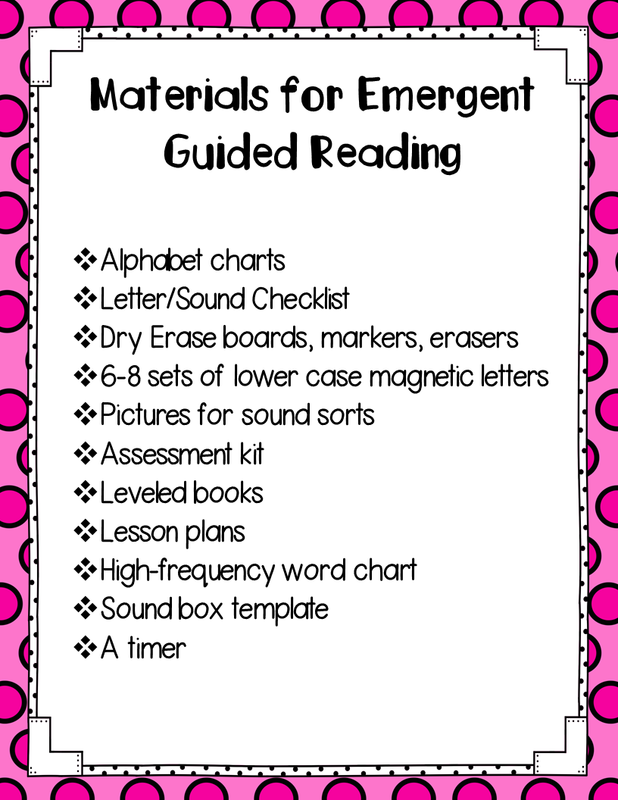 Students can also use magnetic letters or letter tiles to place in each box for the sounds they hear. If students are not to write or use letter manipulatives, they can use three touch lights and touch a light while saying each sound they hear in the given word. We did a lot of sound boxes in centers with magnetic letters and the kids loved them! Definitely going to bring this to Guided Reading groups earlier in the year. 3. Guided Writing - Ok, honesty moment here. I never did Guided Writing during my Guided Reading time. I know, I know, teacher fail. I just honestly never thought about writing about the text during Guided Reading time. But after I read this book I was like, duh! Why didn't I add writing! So one goal for this upcoming school year, incorporate Guided Writing into my Guided Reading time. 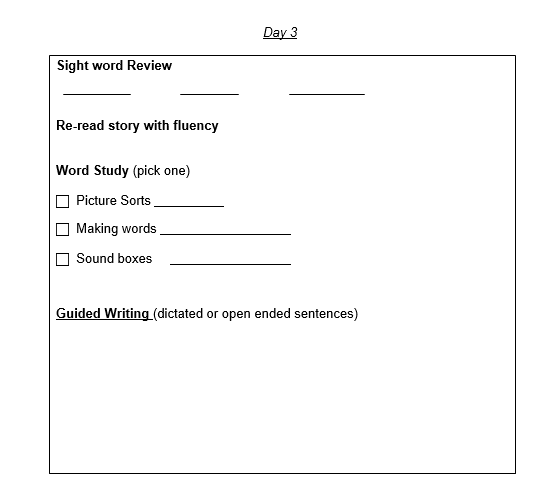 Jan Richardson states that "Guided writing provides the opportunity for students to write a simple sentence that has been carefully crafted to include some known sight words and other words that provide an opportunity for stretching sounds." Encourage students to take risks when they are spelling the words and write the sounds they hear. However, if it is a sight word that you have already taught, it should be spelled correctly. This is a great time for the student to show what they know and for you to see what needs to be worked on for the next meeting. Now how are we going to use all of this amazing information in our classroom? Let me try to help and keep it simple for you. The first thing you need to do is get your materials. Make sure they are close by so you can easily grab everything without wasting valuable instructional time. Now let's move on to the lesson plans. Jan Richardson maps out two days worth of lesson plans for your guided reading groups. I usually meet with my students two days a week so this is perfect. Occasionally I will have a chance to meet with them three days but I use the third day as a quick review, assessment, or fun activity. Always begin your lesson with a quick sight word review. Jan suggests having students write three words that were previously taught. During this time, we do a 1 minute challenge where the students take turns reading as many sight words as they can in 1 minute and trying to beat their number from last time. They love it and get so competitive. Introduce your story by stating the main idea then doing a story walk. Also use this time to introduce any new sight words or concepts. Now it is time to read the story. Students should read the story independently, not chorally or round robin style. Guilty again, teacher fail #2. Teacher prompting is OK and talk students through unknown words. This is the time when you teach the students a strategy to help them become better readers. Use strategies such as one-to-one matching, picture clues, get your mouth ready, cross check, etc. Discussion prompt is not required but you may ask questions to deepen their comprehension. This is harder to do with easy readers. Teach one new sight word using various games such as erasing a letter and ask what's missing, scramble the word and have students fix it, or write it with various tools. Finally end your lesson with a quick word study. This can be done using picture sorts with beginning sounds, etc, word ladders, or sound boxes. Day 2 is very similar to Day 1. We are building on what was done on the first day. Review a different group of already learned sight words. Have students reread the text independently. They may reread the text several times. Review a strategy to help students become a better reader. Teach the same sight word as taught in Day 1 but using a different game or method. Have students write a simple dictated sentence using sight words already taught and words that require inventive spelling to help encourage students to write sounds they hear in the word. 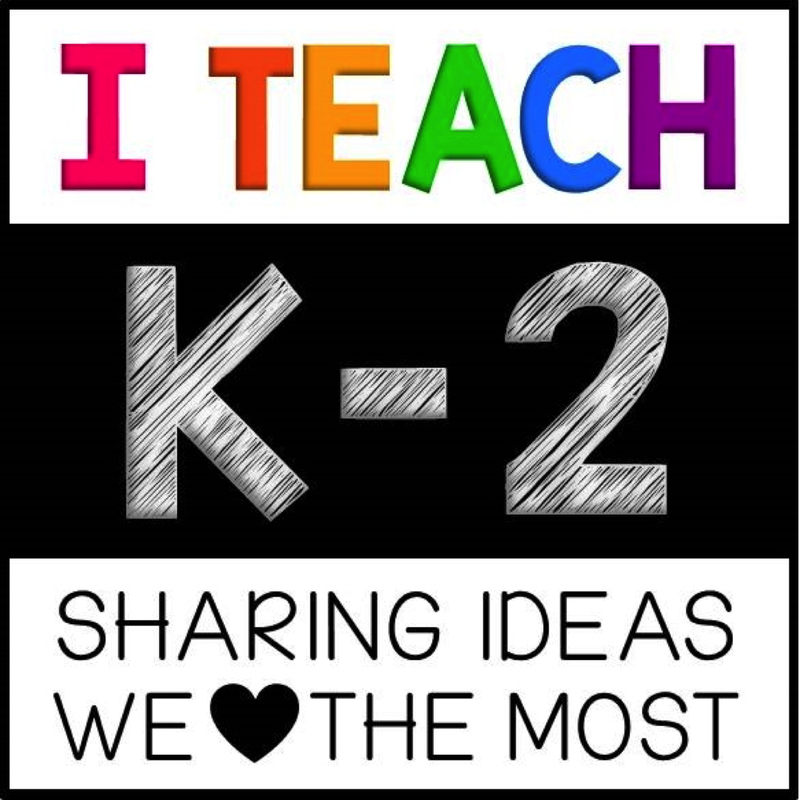 Now I have found that trying to fit all of these activities into one lesson with my Kinders and keep their attention the entire time is very difficult at the beginning. We have to slowly build up to 20 minutes of Guided Reading stamina. Instead, I break these lessons into 3 days instead of two. 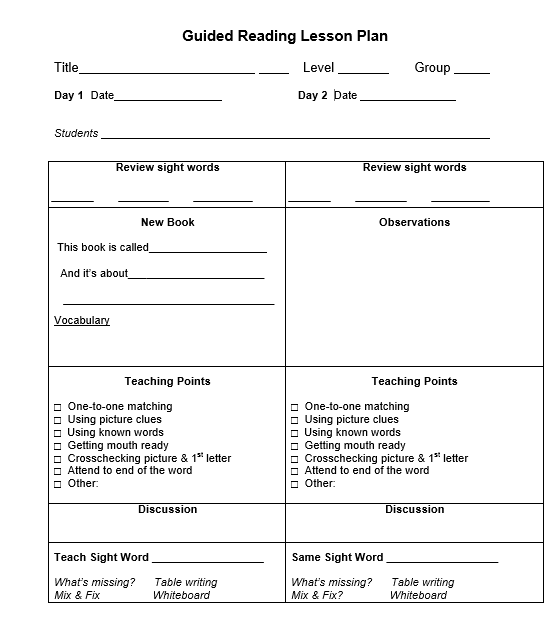 I follow the same format except I leave the word study and guided writing for Day 3 and that is the focus of Day 3. My amazing friend Barbara made this super easy lesson plan template that has it broken into three days. She is letting me share it with you! If you would like a copy of this, click on the image below to download. You can also grab a freebie to try before you buy! The freebie includes 6 cards for each short vowel sound. If you download, I would love some feedback! Now head on over to my other #GuidedReadingGals blogs to read more about Chapter 3!